My mom has a antique baby buggy that she is thinking about selling so I was looking on eBay for something similar to get an idea of it's value. I came across this adorable rabbit buggy. The starting bid is only $49 and shipping is only $20. I can't believe no one has bid for this yet. Click here to see it on eBay. This is the one my mom is selling so if anyone knows an approximate value, please let me know. The little girl in the buggy is my now 14 year old daughter, Lauren. My mom and I had fun dressing her up in old clothes and taking these pictures. The bunny buggy is really cute! Your mom's carriage with your daughter in it is really sweet! Love that bunny! I could see that in your house! Wow, what a neat bunny buggy! Your mother's carriage is so elaborate - how beautiful!! Can't believe she's selling it. I have that exact Bunny buggy! 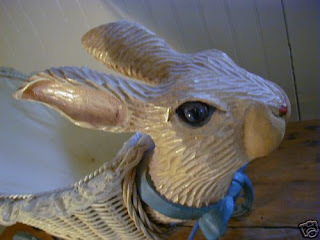 I bought it about 14 years ago when my mom had a gift shop. It retailed back then for about $125. You need to get it! (Don't bid till right at the end and maybe you'll aviod a bidding war... Good luck! what a find! it is so unique and beautiful!! and you just have to love anything to do with bunnies and babies! 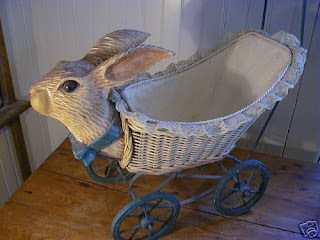 What a great find- and how nice that Tracey already has the same bunny buggy! 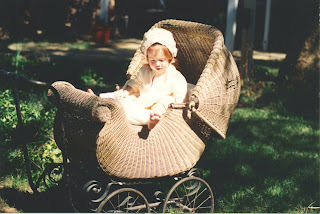 The picture of your daughter in the buggy is so pretty- and so "victoria" as well. The bunny wagon is adorable, but I think its new... I saw a wagon like your Mom's recently here in California for $175.00! Your mother's buggy must be very valuable. I hope she is very sure she wants to sell it! 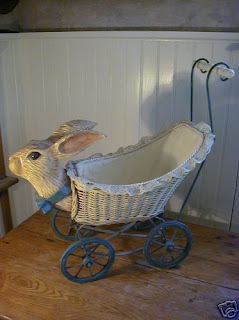 The bunny buggy is just so unusual. Both buggies are so cute!